↱ Choose from several scan modes: full band scan, programmable band scan, and memory scan with programmable memory channel lock-out. There are also two scan stop modes: TO (time-operated) and CO (carrier-operated). The supplied multi-function microphone has backlit keys to facilitate operation in low-light situations. Up to ten 15-digit DTMF codes with ID can be stored for auto-dial and autopatch use. ↳ Redial is also provided. Size: 5.5 x 1.7 x 6.7 inches 2.2 lbs. (140x40x162mm 1 kg). Requires 13.8 VDC @11 Amps. Includes MC-58DM backlit DTMF mic with modular plug. Mobile communications is easier thanks to the Kenwood TM-461A 2 meter transceiver. It is fully equipped, sturdily built and supremely user-friendly. The TM-261A provides 50 watts output (50/10/5 watts). All 61 memory channels can be identified alphanumerically. The TM-261A includes airband receive, auto-power off and auto repeater offset. 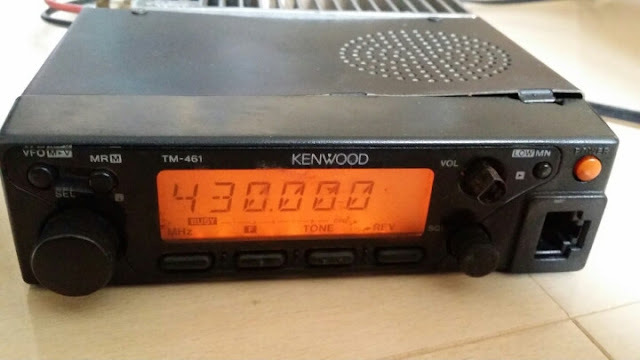 The Kenwood TM-461A transmits on 440 MHz with three output power levels: 5/10/35 watts.